For Baselworld 2015, the Uysse Nardin Freak has under gone a redesign to its movement and for the first time the watch features a date function. 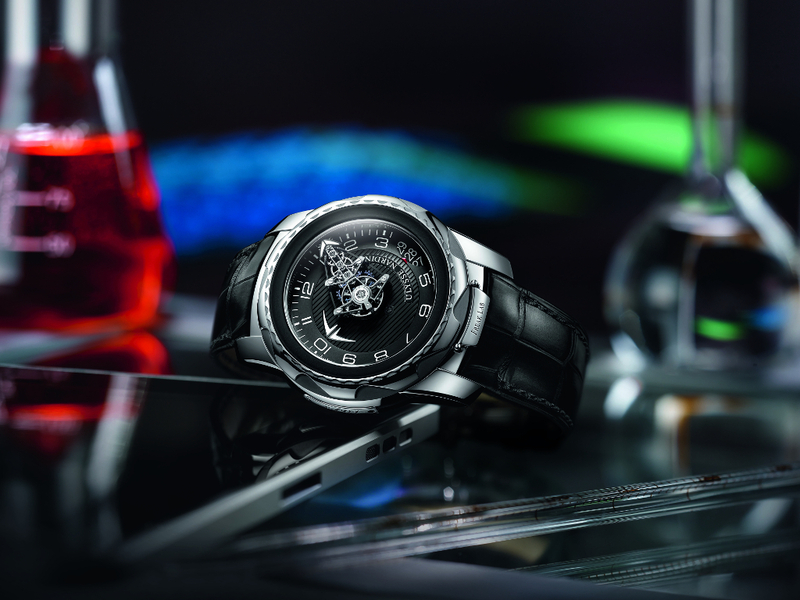 Introducing the Ulysse Nardin FreakLab. On the new FreakLab, the entire floating upper bridge has been completely redesigned. First, the gear train has been made smaller in order to reposition the balance-wheel and balance-spring at the center of the movement. This operation lightened the dial and made it easier to read the hours. The date is located at the 4 o’clock position and is indicated by a red tipped arrow. 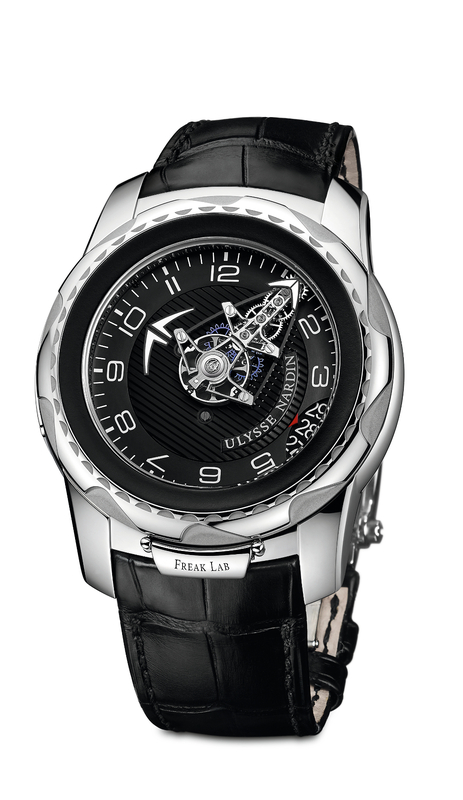 The watch features the The Dual Ulysse escapement. Two silicium impulse wheels, each with eighteen active, meshing teeth, alternately activate a stopper which transmits its energy directly to the balance staff, first in one direction, then in the other. 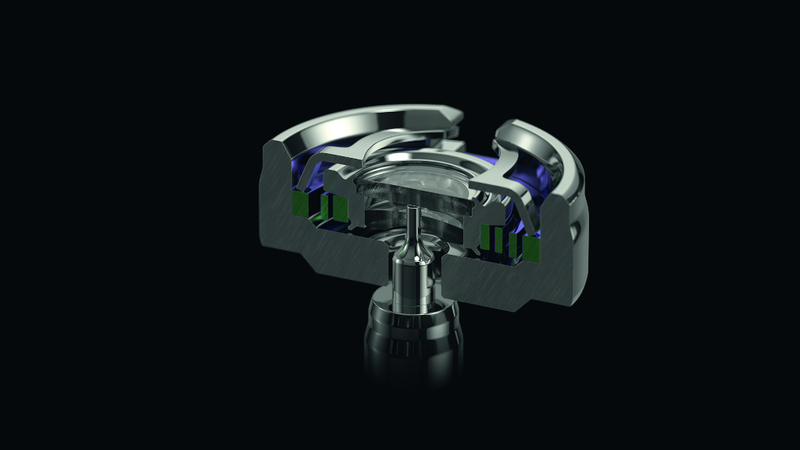 The mechanism requires no lubrication & always delivers its force in the direction of the rotation of the balance wheel, minimizing friction. Silicium is used for the first time in the oscillating unit. The oscillating unit has been equipped with UlyChoc shock absorbers, entirely designed, developed and produced in-house. 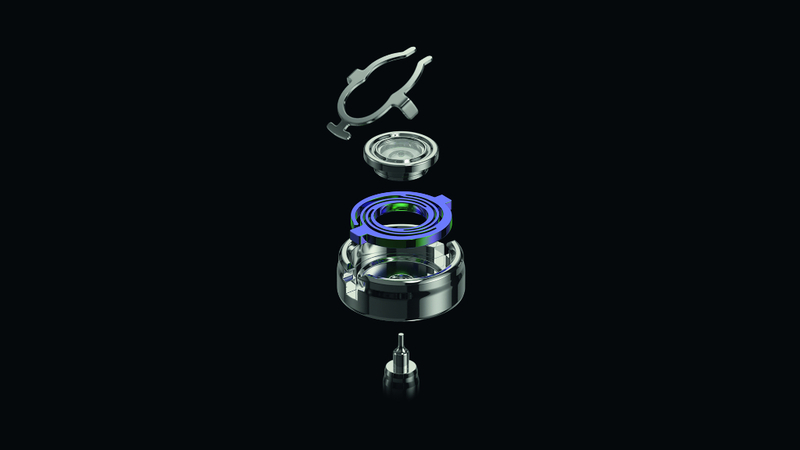 A classical system comprises five micro-elements: the block, the setting, the jewel, the counterpivot and the spring. With simplification in mind and special focus on efficiency, Ulysse Nardin replaced three of these functions with a single one-piece component made of silicium, a genuine world first which is the subject of a patent application. This solution avoids forces of play and friction, enabling the balance staff to be perfectly recentered in the event of an impact. The watch is 45mm in diameter and the case is 18 karat white gold. Like the Freaks of old, the time is set by the bezel at the front. This now includes setting the date. The hours and minutes are adjusted by rotating the bezel clockwise, and the date is set by rotating the bezel anticlockwise. This is locked into place by a safety clip at 6 o’clock. The watch is wound by the 2nd bezel on the back of the watch. When fully wound the watch has more than 7 days of power reserve. No crowns needed. Both setting of time and date are done with the front bezel. The bezel at the back is used to wind the watch. We think the new FreakLab looks very good with its new date window, and applaud Ulysse Nardin for continuing to explore the use of innovative materials.